With the top finished two project remained to be completed ~ side curtains and a protective boot to cover the top when it is down and stowed. Pictured above are the side curtains installed on the left side of the car. The car came from Marvin Klair with five panels per side. 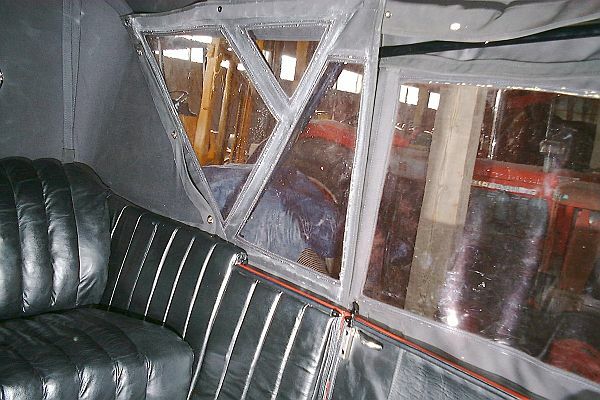 It is unknown if the curtains were original to the car however the general consensus is that they were new when the top was changed during the 1950-1952 restoration. In any case the curtains were quite a problem to sort through and figure out which curtain went where on the car as nothing was labeled. Additionally the curtains had a lot of material area which cut down considerably of one's ability to see out of the clear plastic. 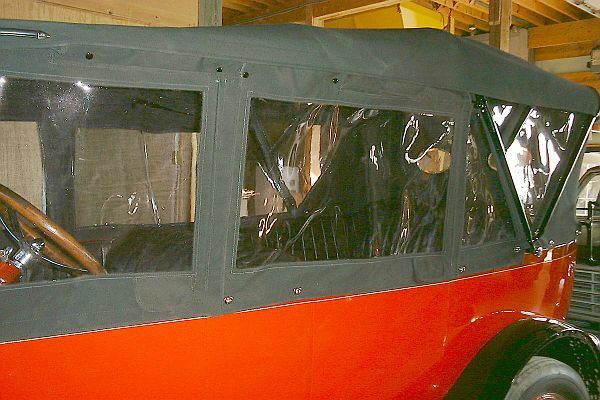 Thus the decision was made to reduce the number of curtain panels from five on a side to three on a side which also allowed more clear area to be provided for visibility. Each of the car's doors has a nickel plated cavity for receiving a steel support rod. 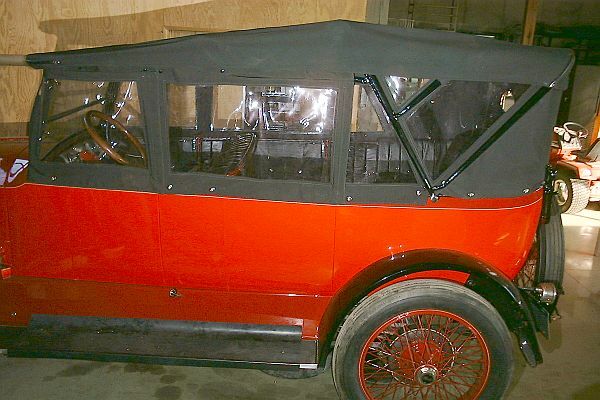 The rod holds the side curtain for the door in place while the door is opened and closed. As the door handles are inside the car's body each of the curtain panels over a door handle has to have a flap to allow access to the door handle for opening the door. From the rear seat of the car one can see in the photograph above how the curtains are secured at the top. Originally the top bow sockets and legs of the top bows had common sense fasteners installed for securing the side curtains. This is how all the holes got into the top bow sockets over the years. The sockets being of tin construction, the common sense fasteners would pull out and a new hole drilled to relocate it. 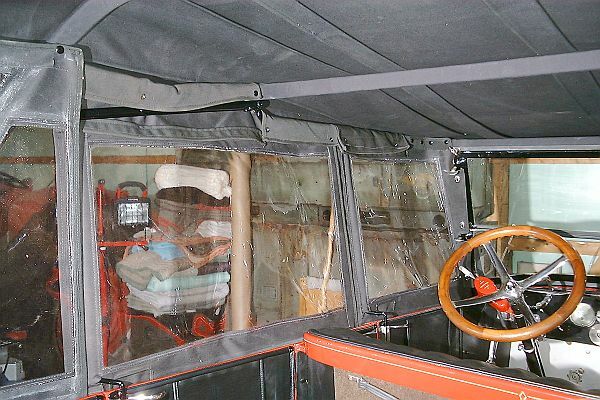 To eliminate this problem, even though the sockets were now epoxy filled, the curtains were constructed to wrap around a top bow socket and be snapped in place thus eliminating a great number of common sense fasteners needing to be mounted in the bows and bow sockets. At the rear of the car one of the nickel plated door post receptacles holding a black metal door bar can be seen in the photograph. The black bar runs up a pocket in the door side curtain to hold the curtain in place as the door is opened and closed. The rear side curtain on each side of the car is actually installed on the inside of the top bow socket. The top bow socket for the fifth bow is the only one needing to be drilled and tapped for the mounting of a common sense fastener. The rear side curtain is held in place along the top with glove snaps installed on the inside surface of each bow.